We will implement the Plan and agree how best to review progress. 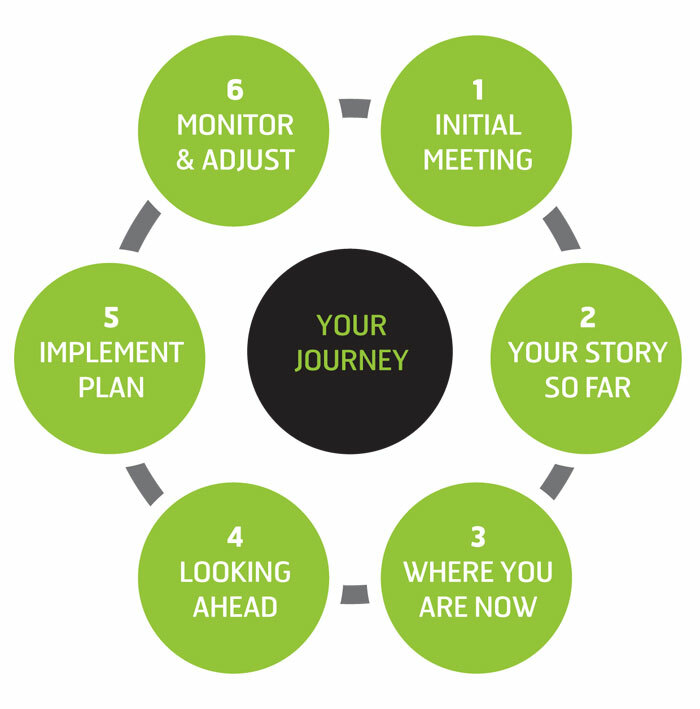 Our stress-free process typically takes 3 years to fully craft, implement, review and imbed your Plan. We will work with your other advisers and perhaps other experts to ensure that any actions taken are in accordance with your long-term aims, rather than purely seeking short-term advantage which may run counter-productive to your real goals. We will provide you with the necessary support to make difficult decisions and will not avoid providing you with an accurate evaluation. The more we understand about what motivates you and your value system, the better our advice. As with any healthy relationship, in time more and more of the inner person is revealed – much like the nature of a fine wine. There is no fast-track to this degree of understanding, it only comes from the most valuable commodity of all – time. We will help identify, clarify and prioritise your goals. We all have a collection of financial baggage. We will locate, verify, collate, analyse and explain what you already have. This provides the basis from which we can begin. We will report back to you a clear assessment of your current position and assess how much you have already progressed towards your goals. There is invariably more than one way to achieve your goals from where you are today. We will explore a range of options and provide a set of solutions that we believe are most likely to work best to form your Financial Plan. Once we have determined what must be done, we will get everything in place so that getting started is as easy as possible. We will review your progress and ensure that your Financial Plan is on track, making necessary adjustments where necessary. This will also ensure that your plan is not an academic exercise, but a living, working, relevant and practical report.